It’s still a mystery: How do the tiny larvae of marine animals that hatch in the open ocean find their way to coral reefs where they settle as adults? One theory is that they home in on suitable coral neighborhoods using sounds made by coral reef denizens. But a new study by Woods Hole Oceanographic Institution researchers showed that sounds created by adult fish and invertebrates may not travel far enough for larvae to hear them. Kaplan and his Ph.D. advisor, WHOI biologist Aran Mooney, made painstaking acoustic measurements off the Hawaiian island of Maui, placing sensors at distances ranging from zero to nearly 5,000 feet away from coral reefs. The scientists used two different types of instruments to record two different components of sound—pressure waves (the element of sound that pushes on a human eardrum) and particle motion (the physical vibration within water as sound waves travel through it). The latter, Kaplan explained, is how the majority of fish and marine species detect sound, yet no previous studies have focused on recording it. Invertebrate species such as squid can detect vibrations through their statoliths, the invertebrate version of ears. Similarly, adult fish sense them through the motion of tiny bonelike structures called otoliths inside their skulls. 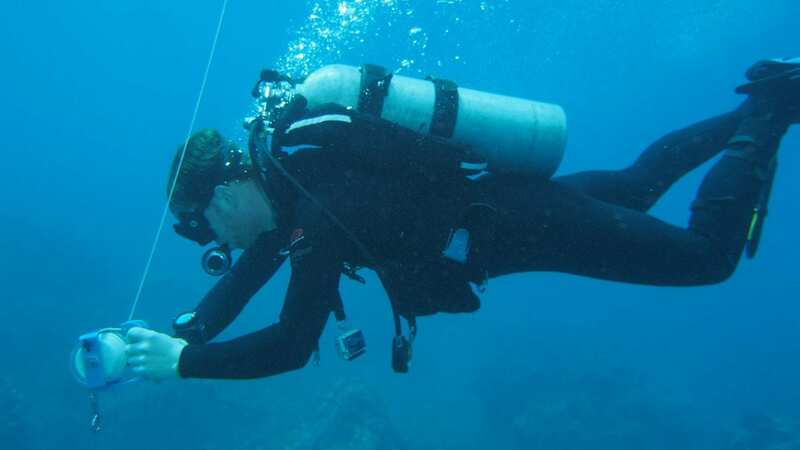 Although researchers in the past have detected reef sounds from many miles away, Kaplan said that most of those studies rely on a hydrophone, an underwater microphone, which can detect only pressure waves. In their Maui study, however, the researchers recorded particle motion as well, using a sensitive accelerometer alongside a hydrophone. Their experiments found that particle motion was much lower than expected, dropping rapidly below levels that most marine species can sense—even just a few feet away from the reef. “It’s possible that larvae can still use chemical signals from other animals to locate the reef, or maybe can read the currents to move toward shore,” Kaplan said. He thinks that once larvae do locate a reef, sound may play an important role in finding a suitable location to settle down, which is key to their survival. Kaplan said his findings might be useful for reef conservation efforts. “To keep a reef healthy, you need a constant supply of new larvae to repopulate animals that die off,” he said. Past studies have shown that larvae are attracted to reef sounds when played through an underwater loudspeaker, so Kaplan thinks that playing recorded biological sounds could be used to steer larvae to damaged reef areas and help repopulate them. The research, published in August 2016 in the online journal Scientific Reports, was supported by the Woods Hole Oceanographic Institution Ocean Ventures Fund, the PADI Foundation, and the WHOI Access to the Sea Fund.